A solid-state drive is made from flash memory chips and can deliver an overall boost in performance compared to a hard-disk drive. But flash memory chips are expensive so SSDs typically have a lower capacity than HDDs. The SSD in the new drive has a capacity of 32GB. 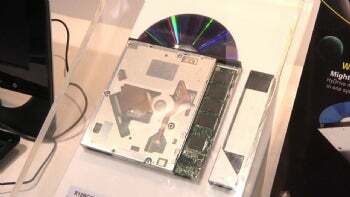 LG Hitachi expects the drive, which it calls the "Hy Drive," will be used in laptop computers alongside a traditional hard-disk drive in a laptop, said Philip Cho, senior manager of the company's overseas sales team, at the Computex trade show in Taipei. If the operating systems and programs are installed on the SSD and the hard-disk used for data, users should see a performance boost over a conventional laptop with a hard-disk drive. Hitachi LG plans to begin mass production in August this year. The drive will be offered to laptop makers for use in their products.